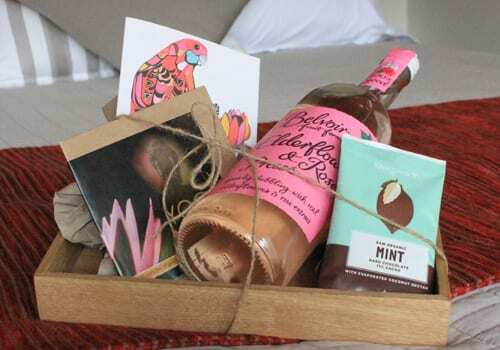 If you have a birthday, anniversary or other special occasion to celebrate whilst at Billabong Retreat you can order a celebration pack with a special message to be waiting in your room on arrival. Please note we do not offer a birthday cake service. Gift package for celebration of special occasions includes bottle of organic elderflower sparking drink, yoga relaxation CD, gift card (specify text required) and organic dark chocolate. Pack will be on the bed when you arrive. Wooden tray not included. 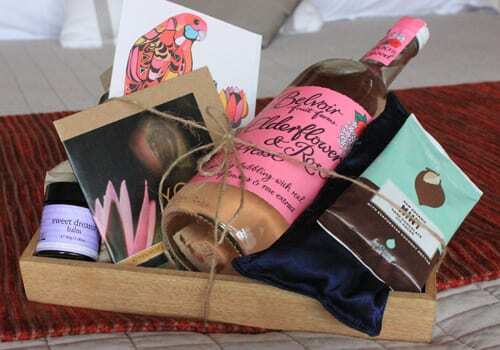 Gift package for celebration of special occasions includes bottle of organic elderflower presse sparking drink, yoga relaxation CD, gift card (specify text required), organic dark chocolate (as per standard pack) plus massage balm and eye pillow (only in extra pack). Pack will be on the bed when you arrive. Wooden tray not included.